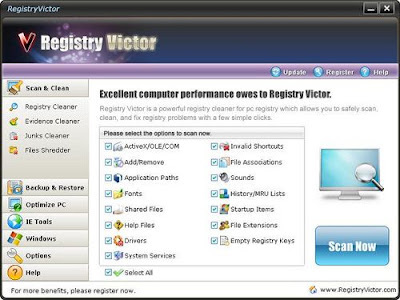 Registry Victor is a top-ranking error-resolution registry cleaner which will fix the computer errors and optimize the system speed. In normal use, various annoying registry errors will gradually creep into your system, causing problems such as slow speed, crashing or freezing, blue screens, deadlock, error messages etc. Registry Victor™ uses the most advanced technology to scan your hard driver and give you a comprehensive diagnosis in seconds. Once the problems have been identified,Registry Victor offers you a professional and highly efficient solution, which will keep your computer functioning perfectly. By using Registry Victor regularly, your system should not only be more stable but it will also help streamline your pc registry without expensive hardware upgrades. Performs an all-around scan of your Windows registry to detect and fix invalid references and incorrect errors, which also helps streamline your pc registry without expensive hardware upgrades. Your pc will act like new and run much faster after using this tool. Protects your privacy by ensuring all traces of your online Internet and computer activities permanently to be erased and unrecoverable on your PC which speeds up system performance and retrieves more hard drive space. Scans and removes almost all junk files from system to provide more free space on your hard drive and allow application to run faster and more efficiently. This tool will help to keep your system free of clutters and clean up all the unwanted data and information. With three different shredding levels, file shredder will shred or destroy unwanted files beyond recovery. It completely removes a file or folder or drive information from yourcomputer making it nearly impossible to restore again. PC Optimizer Is an optimizer toolkit containing Startup Manager, Uninstall Manager, System Optimizer and Service Optimizer. Besides well supervising the startup and un-install programs, it also optimizes network speed, disk, desktop, files and system service to peak performance.